I made these olive penguins (with my wife’s help) for this evening’s Vegetarian Supper Club in Eugene, OR, as a fun appetizer when people came in. Hopefully they’ll be a hit! They were really fun to make. Cut carrots approximately 1/8 inch (3mm) thick… this will become the feet and beaks (just shy of 1/4 of the carrot slice is beak-size). Cut large olives down one side (length-wise) and then fill with a small amount of cream cheese. 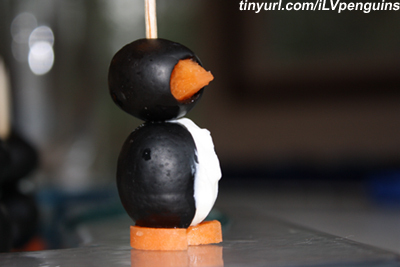 Assemble penguins with a toothpick like shown in the picture at the top of the page. 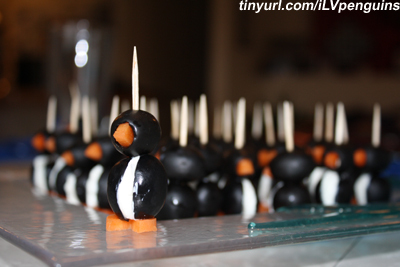 Get crazy and start a penguin war with extra toothpicks and ketchup for penguin blood. This is a mainly music-based blog. If you stumbled in on a recipe search, check out my other recipes, like vegan biscuits & gravy, spiced biscotti, vegan cactus chili, vegan bananas foster, mushroom dumpling stew, strawberry cornbread muffins, fruit spring rolls, grilled coconut-rum pineapple, vegetarian s’mores pouches, pumpkin-infused vodka cocktail, and creamy vegan chocolate pudding at THIS LINK. That is amazing! I love how they look, and I love olives and cheese so I just can’t wait to have an opportunity to make these! Thumbs up! It is something unique recipe. Thanks for the tips. I thought these looked so cute, I included it in my linky love today! I love penguins :D.
Yeah, it got a bit messy for us, too. I got started and then had to bring in another set of hands to help. And a wet paper towel helped clean up white from the olive’s black. Glad they went over as a hit at your party. My daughter and I made about 70 of these little guys for her wedding shower that is tomorrow. They are so cute! To avoid the mess of the cream cheese, I bought the whipped cream cheese and loaded it up into those cake decorating piping bags with a round tip. Worked out great!! The cream cheese is messy, but if you use mozzarella cheese sticks ( string cheese ) and cut them at an angle / \ / \ / \ , you can fill the wedge in the bigger olive with this piece of cheese. It’s alot neater!!! This is so cute. Just a small tip for your recipe though. 1 mm (millimeter) is about the thickness of a piece of paper. Did you mean 1 cm? um… that’s thick paper if it’s 1mm thick… but I see your point. 1cm is also quite large for the feet, I think. Maybe 5 mm… that’s half way to one cm. I revised to about 1/8 inch. Really, it’s all a judgment call… and depends a lot on the size of the olives you’re using.